Dina always goes above and beyond to immerse herself in the brand she is working on. 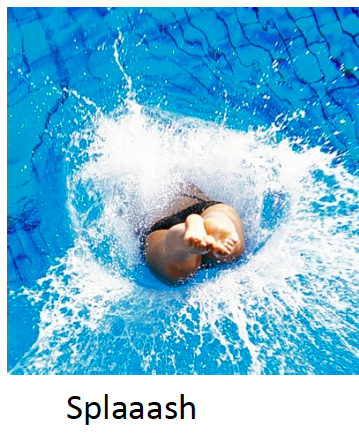 She is able to go with the flow and jump right into the project to keep it moving forward. Dina is able to bring fresh ideas to the table and think out of the box in order to provide the Business with innovative ideas and concepts that help meet the Business Goals. " “I have had the opportunity to work closely with Dina on multiple projects. She has always been a tremendous asset to the team." 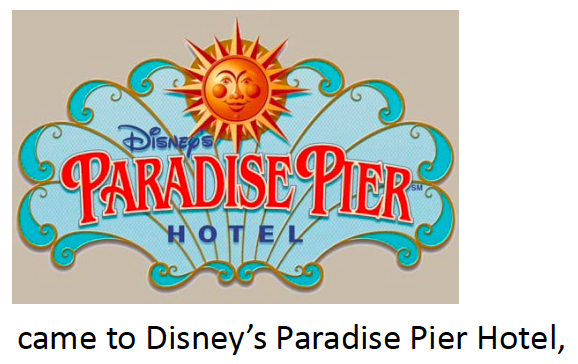 Disney's Paradise Pier Hotel needed a brand revamp, to rise from last when compared to the premium Grand Californian Hotel & Spa and the luxurious and classic Disneyland Hotel. After the redesign, the key feature of Paradise Pier Hotel key feature was (still is) the Disney-style service: extra attentive and helpful. Though this may be the comparatively more modestly priced DLR Hotel, the service remains top quality, the amenities abundant, the fun plentiful. These were message points to address in this script. I wrote this script after watching The Artist and was inspired to tell stories without, or with few, words. The tone of this video is bouncy, light and inviting. Emphasis on ‘inviting’, as in, come here; this I where the fun is! 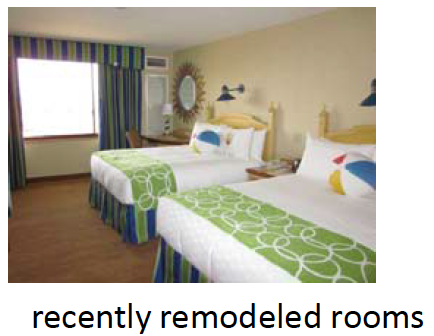 The main selling point at Disney’s Paradise Pier Hotel is the signature Disney-style service. A Cast Member should appear in almost all the shots to highlight their attentiveness—perfect hosts. The Cast Members actions (and appearances) should be athletic and slightly larger than life. In the story of the Hotel—the heyday of beach boardwalks—the Cast Members are the showmen and women of the famous Southern California surf scene. The shots are sun drenched and colors saturated—but with a breezy air of nostalgia and wistfulness: a wish for an endless ideal summer, almost dreamlike. The soundtrack carries the narrative, and is punctuated by sound effects. Quick, clean editing captures the playful nature of this family-focused hotel. 1 Light, bouncy, playful MUSIC introduces the POV of a Little Girl. Her “eyes” (the Camera) are covered by her parents’ hands. The hands slowly reveal…what? The sun is so bright. There’s a LENS FLARE, and a WARM SUNNY HAZE fills the frame. 3 CLOSE-UP on the Little Girl’s face. Her eyes are wide. Her mouth an OH of surprise and excitement. 4 The Little Girl grabs her parents’ hands and runs away from the CAMERA, part dragging her parents behind—her GIGGLING is part of the SOUNDTRACK—into the enveloping sunlight… into the wide open entrance to Disney’s Paradise Pier Hotel, where a smiling Cast Member is barely visible through the thick sunlight. 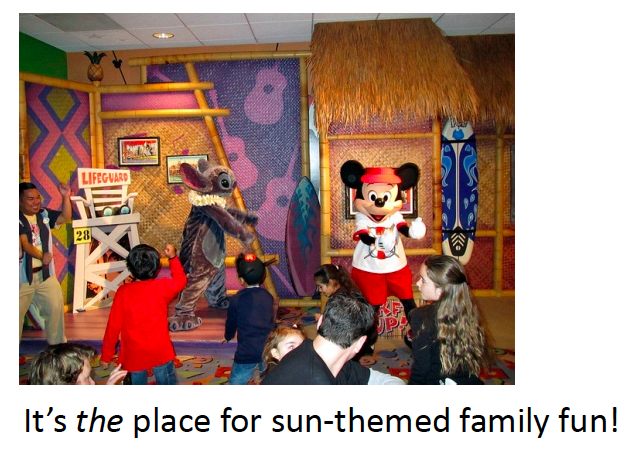 The Cast Member theatrically holds open the door with a crisp, choreographed, ta-dah wave of his arm: Welcome! The sun glints off the door. A photo flash. POP. OSS of a Cast Member as she takes photos of a family—Mom, Dad and twin boys—posing by the landmark Surf Goofy statue. The boys make silly faces. Another POP SOUND of an old-time camera flash. A family—Mom, Dad, a girl and boy—pal around with Disney Characters, including Goofy, during the Surfs Up! Breakfast with Mickey and Friends. 8 A wait-staff Cast Member presents to the CAMERA: a cloth napkin, held in one hand, which conceals, like a curtain, what he’s holding in his other hand. With a flick of his wrist, he whisks the napkin away—which the CAMERA FOLLOWS in SLOW MOTION—to reveal a cupcake topped with a lit candle. The discarded napkin is a TRANSITION. The MUSIC slows a little here, perhaps gets a bit more sophisticated. Two women, sisters, drape their brightly colored beach towels over lounge chairs by the pool. They sit and recline—and relax. It’s finally time to bask under the blue sky and spectacular sun. 10 A couple spend a calming moment in the hot tub. 11 The MUSIC returns to being playful, but not as bouncy. The day is slipping into evening. 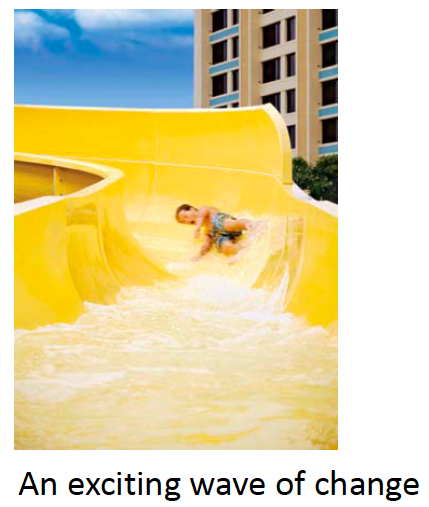 A boy slides down the waterslide while a Life Guard Cast Member cheers him on. The water SPLASHES and catches the setting sun. It SPARKLES in front of the CAMERA—like pixie dust. A KID drapes a brightly colored beach towels across pint-size Adirondack chair. 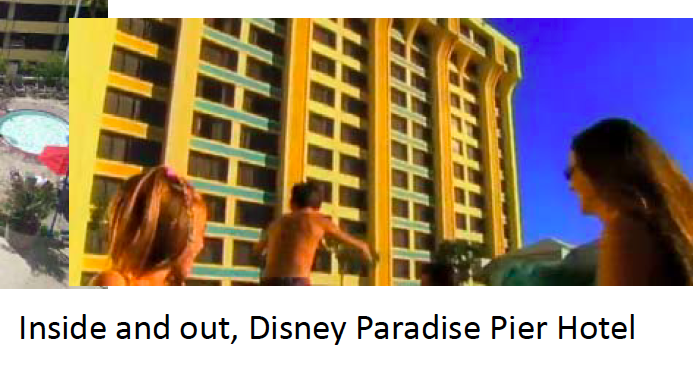 ZOOM OUT to show the room is full of KIDS at the beach-themed Paradise Theater. CHILD-CARE CAST MEMBERS watch over their brood. 13 Close-up to what’s playing on the TV: Tinker Bell and her splash of pixie dust cross the screen. A PANORAMIC, post-card shot of FIREWORKS from the impressive WORLD OF COLOR show is perfectly framed by a Hotel suite window. Camera pulls back and reveals the interior of the Hotel suite. The LIGHTS are cozy and low in the room, but bright enough to see some of the whimsical details. 15 The Little Girl (from the first shot) is tucked in bed. She snuggles a plush Goofy—and wears sunglasses. 16 The Little Girl’s parents, as they look down at her, satisfied and smiling. 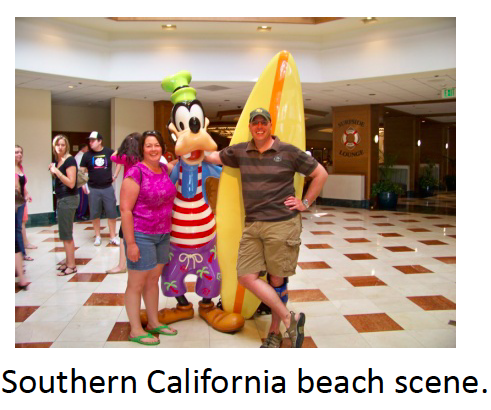 …at Disney’s Paradise Pier Hotel. 17 Close-up on the Mickey Life Guard lamp. The mother’s hand reaches in frame and turns off the lamp. The tone should be bouncy, light and inviting. Emphasis on ‘inviting’, as in, come to the party; this is where the fun is! Show off the seashore décor, and highlight the theme of Southern California beach boardwalks. Sundrenched shots, if possible. Quick, clean editing should capture the playful nature of this family-focused hotel. Here are tag lines I wrote for a pitch to the Disneyland business, brand SVPs. The Disneyland business, brand team wanted a series of videos to showcase the Guest Services in the Park. A storybook page fills the frame, in script font: Chapter One. Once upon a time, Mom, Dad & Little Dolly traveled to the Disneyland Resort, so Little Dolly could meet Snow White for the first time. 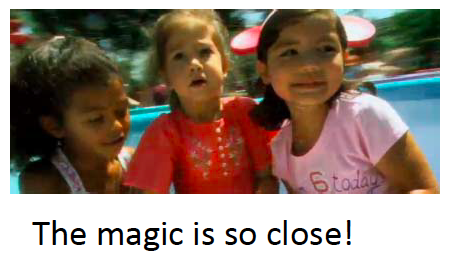 Little Dolly may be little, but her excitement for this trip is very big! On the first morning…out the Disneyland Hotel the family went, and, after a short walk, they were at the stroller rental near the Main Gate. Here, we ZOOM IN on the side-bar of the IMAGE (/ illustration) of the map and there is some bilingual information on the side-bar of map about how to rent strollers. How convenient, everything is so close! Now, through the Main Gate and here is the family on Main Street, U.S.A.! The CAMERA stops at Main Street on the IMAGE (/ illustration) on the map. ...a WIDE, LIVE SHOT down Main Street. The CAMERA quickly TILTS to the ground to reveal a red, velvet ribbon, not unlike the one Snow White wears. Oh, no, Dolly’s hair ribbon has fallen. Little Dolly, my princess, let me help you. Dad picks up the ribbon from the ground and “hands” it to the camera, establishing the camera as Little Dolly and everything’s shot from her stroller point-of-view. He fusses with the ribbon to “put” it back on Dolly’s head. I’m going to pick up some apples. Uh-oh. I think someone needs a new diaper. And soon. No problem. In a flash, the family found the clean and quiet Baby Care Center, a few steps off Main Street, U.S.A, made a quick change and continued on their way. The family is exiting the Castle. Fantasyland is in front of them. To the Princess Fantasy Faire! Turning around to face the camera, she offers an apple slice to the camera. Would you like some apple now? At this moment, the Evil Queen crosses their path and walks across the Castle Draw Bridge into darkness. The CAMERA “shakes” her head no. Wow, it’s like an enchanted forest in there. At the Princess Fantasy Faire, Little Dolly got autographs from Cinderella, Princess Tiana and Princess Rapunzel, but alas, no Snow White. Maybe it’s time for a ride! Isn’t the Matterhorn your favorite, dear? It is! But (pointing to the camera, he whispers) what about Dolly? The parents look up. They look around with confused Did-you-hear-that? Is-he-talking-to-us? expressions. Disneyland Park is for kids—and kids at heart! Use Rider Swap and hop on the Matterhorn! First Dad pulls up in the Matterhorn vehicle. Smiling at the end of the ride. Next Mom pulls up in the Matterhorn vehicle. Smiling at the end of the ride. and then, they switched without waiting in line again! Mom hands an apple slice to the camera. You look sleepy, honey. Look, Little Dolly’s falling asleep. The CAMERA “blinks” once, then FADE TO BLACK. The CAMERA pans around the treasure map of the park. While Little Dolly took a quick nap in her comfortable stroller, Mom & Dad tried out Rider Swap on more attractions. Let’s see where they are now…ah, the Wishing Well. The CAMERA “blinks” awake and we return to Little Dolly’s sleepy-but-slowly-waking-up perspective. The image, once it comes into focus, is of Dad throwing a coin into the Wishing Well next to Snow White’s Grotto. I wish my daughter could meet Snow White. An echo! Make a wish and if you hear an echo, it will soon come true! The text reads, “ “Snow White!” said everyone at once. The father’s wish came true. And so did Little Dolly’s.” Next to the text is an IMAGE (/ illustration) of Snow White giving Little Dolly a hug. Mom & Dad beam in the background of this picture.